Are you looking for paths to urban success without parking excess? One day, autonomous vehicles may solve our parking problems (or almost). But for now, most parking policy in most places is doing real harm and needs fixing! Most municipal parking policies are pushing too many parking spaces into the urban fabric in the vain hope that plentiful parking will reduce parking chaos and nuisance. It is not working. We need parking success without parking excess. This site offers ideas to prevent parking policy from standing in the way of all the other things we want from our cities. Communities, and even parking owners, deserve more value from all those parking spaces. A successful parking system should not impose long-term car-dependence. Are you a "Shoupista"? 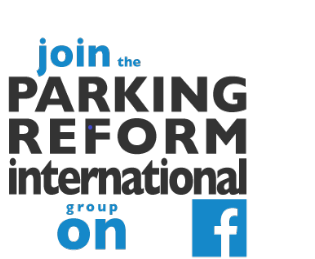 Are you inspired by the parking reform ideas of Donad Shoup? Then you are definitely in the right place! This site aims to develop those ideas further, to apply them to diverse international contexts, and to expand their popularity. Are you just frustrated about on-street parking chaos? Do motorists complain about shortages of parking, while off-street parking sits half empty? Does no-one seem to have answers except to require more and more parking? This site offers real solutions to parking problems but NOT via plentiful and cheap parking. You have come to the right place if you too want parking success without excess. Maybe you are working on some other urban or transport issue but conventional parking policy is getting in the way. Then you have probably come to the right place too! This site explores how to make parking policy successful on its own terms AND more compatible with other important policy goals that are harmed by parking excess. Such goals include fiscally strong municipalities, walkability, safe cycling for all, sensitive urban infill, transit-oriented development, better public transport, car-lite planning, placemaking, safe and liveable streets, thriving communities, space-efficient mobility, compact cities, lower-energy transport, reduced impermeable surfaces, and affordable real-estate and housing. You could be almost anywhere. The focus is cities and towns, not rural areas. But this site is not aimed at any specific country or region. We write about rich places and poor. We look at car-dependent cities and those where motorization is low. The aim is to help, no matter where you are. If you are new to the site, go here for a list of key posts to get you started.